Ragi roti is mainly consumed in South India. Ragi (Finger millet or african millet or nachni ) is highly rich in calcium. Infants are usually fed with porridge prepared out of Ragi. Usually, ragi is first washed and then dried up in the sun and later on it is floured in the mill. Many dishes are prepared out of ragi like upma, dosa, sevai, idli and so on. I have shown ragi roti here, which is a very healthy and a nutritious breakfast. This dish takes around thirty minutes to prepare. ( Twenty minutes to prepare the dough and another ten minutes to cook ). First and foremost, heat a pan with half a cup of water in it. When the water starts boiling, add salt and the ragi flour by gradually stirring the water till the flour turns in to a solid consistency. Add chopped onions, green chillies, coriander leaves and coconut scrapings into the dough mixture. When the dough is completely cooled, add some more water so that the dough turns smooth. Now, roll out small medium sized balls. Take a brown paper and grease it well with oil. Now, place a ragi ball over it. Grease your fingers slightly with oil and pat the ragi ball from the middle towards the edges so that a thin flat circle is formed. In the mean time, heat a non- stick griddle ( tawa ). Transfer the bind sheet upside down over the tawa and slightly release the bind paper from the roti. Smear one tsp of oil on all the sides of the roti. Flip the roti on to the other side when brown spots appear. Transfer the roti on to the serving plate. You can serve the ragi roti with a dash of butter. Ragi Rotti is now ready to be served.!!! 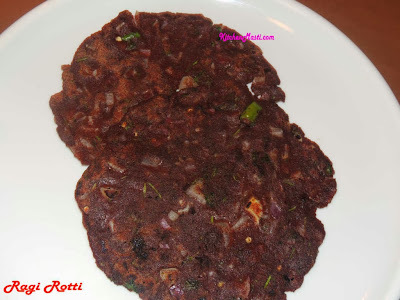 Ragi roti can be eaten along with kolhapuri garlic chutney or simple garlic chutney. You can add grated carrot to the dough mixture to make it more nutritious. This roti should be eaten hot or else it might not taste that good when cold.